Choosing to continue your education throughout life is an important tool to attain your goals. 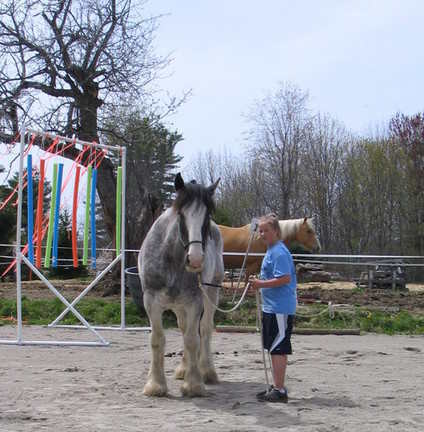 Here at Blazing Star Stables natural horsemanship is practiced both by myself and students. Students are able to join in any clinics that are offered here, and those clinics that are offered elsewhere. I have chosen to take classes and continue education as a role model and inspiration to my students. Weather was a blistering 80F and sunny as could be! 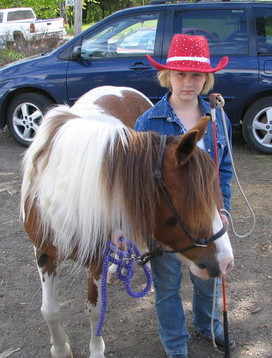 Showmanship classes were a bit hot, and the kids did great. 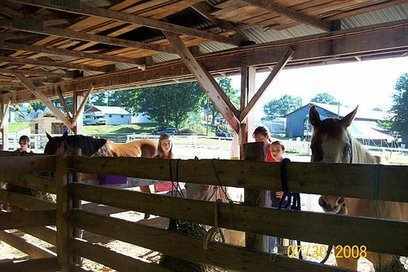 Addie, Kaitlyn, and Courtney braved the day with Dobbin, Brody, and Moony. We did have a HUGE thunder storm after lunch, but waited it out like true Mainers and proceeded to show again after. Had to put this in here... where else can you watch a floor swallow a person. 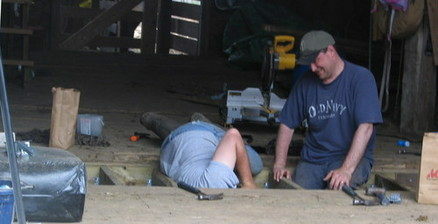 Well, we broke the floor dropped a round bale on it and . 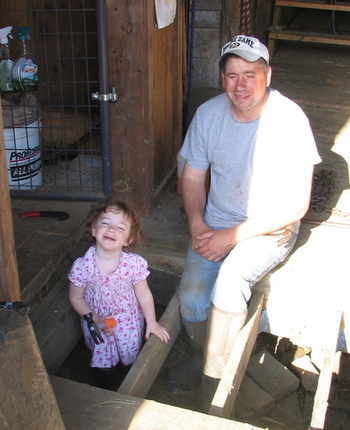 Mike and John repaired it, along with some help from Amelia who is quite the builder! 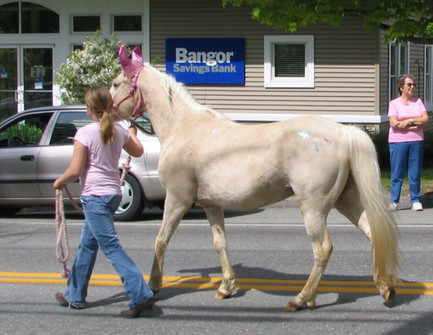 of times, yet proved they had control when new horses were "visiting", calling to each other, and stressed by others different styles of "handling". 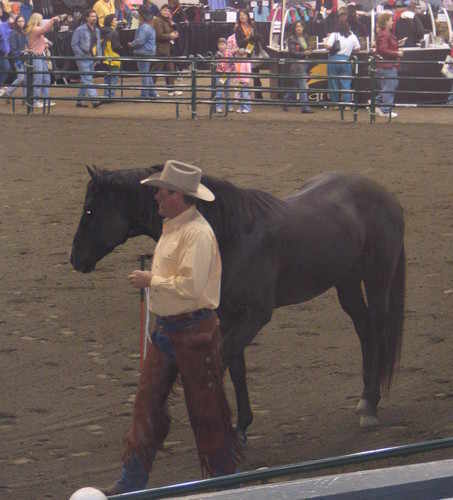 others are striving to better themselves and become a true horseman, advocating for the horse which incudes the respect of the horse. 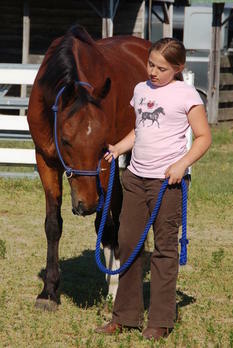 their constant awareness of when they or thier horses became confident, unconfident, relaxed, nervous, and/or zoned out. 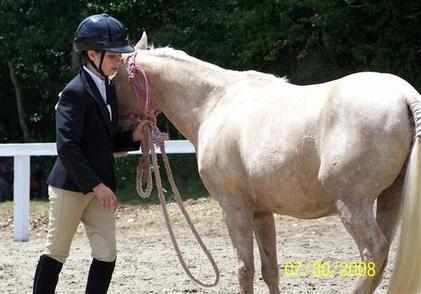 To me being able to understand what horse is present under you is when the most learning and teachable moments surface. 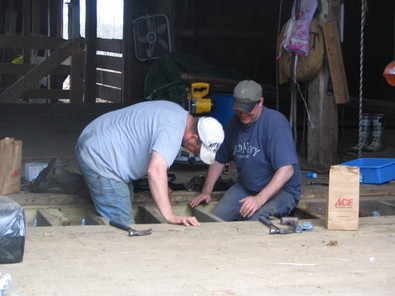 eaning, and preparing the riding ring now at the fairgrounds. 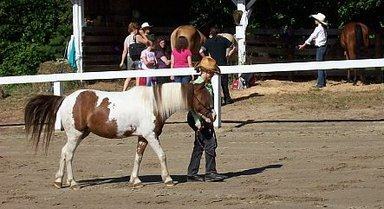 This was the first "open" horse show in years at the fair, and it was a smashing success. wasn't supposed to be. Meanwhile Arizona made sure that not a single piece of hay was left over or would go to waste and even toted Amelia around the ring a few times. 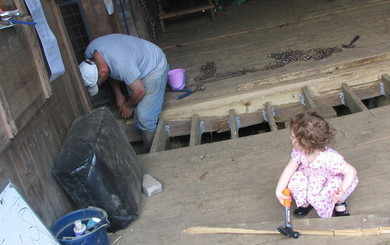 The kids were responsible for doing everything themselves, including tacking up which proved to be a bit of a challenge without me right there. We are now more prepared for the next show in October. 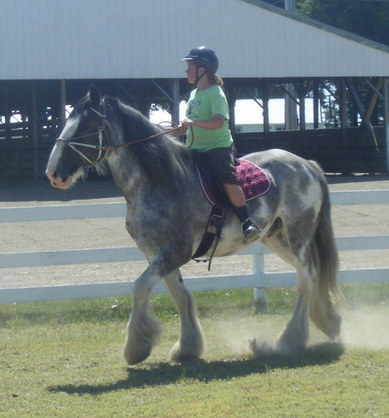 Dressage, games, jumping, anatomy, driving, and teamwork were all taught at camp by different instructors. 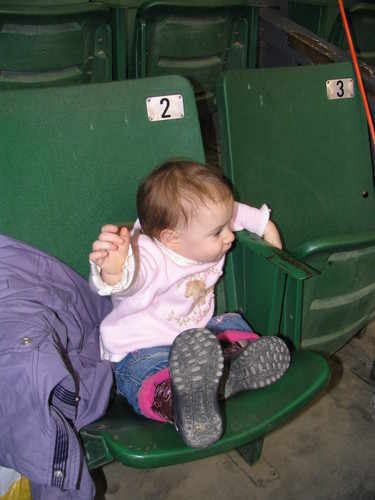 Even the little ones liked it! 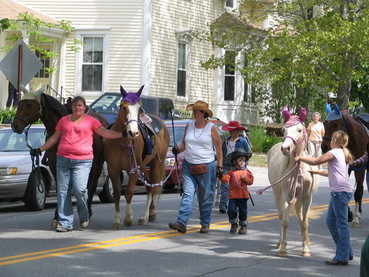 obbin, and Soliel were groomed up worked and then lead down the road to Cumston Hall where the parade would start....all made it through the Parade then to the beach, and finally on the way home we were all blessed with Murphy's Law when an F-16 fighter plane flew right over us in the middle of the parade! 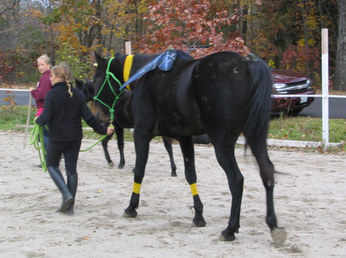 All in all we did well, no one was hurt but horses were definatly ready to go back to the barn. 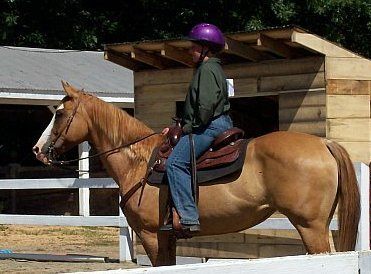 Parelli Instructor at Blazing Star Stables! May 9th, 2008 blessed us with a super clear sunny day! 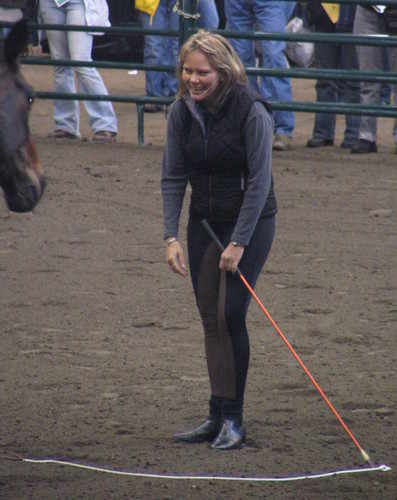 Gina Torrell of PA travelled to the barn to present us with a day of Parelli Games... what an awesome time all had! The seven games were explained in detail, practiced with a lot of effort, and enjoyed by all. 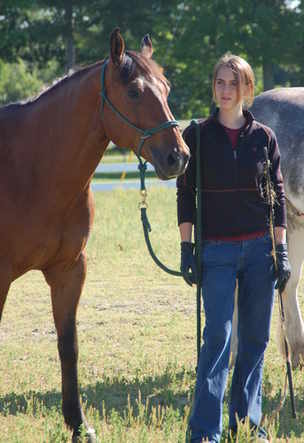 Gina will be coming back this fall to continue the Parelli Level 1 Certification and Parelli Level 2 Certification. 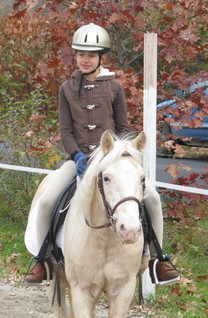 Parelli Clinic in West Springfield Mass. 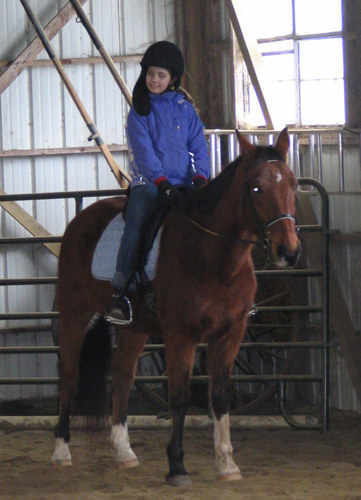 April 11, 2008 Addie, Whit, Amelia, Kerstin, Kerstin's Mom, and Myself all braved the highways and toll booths to go see Linda and Pat Parelli. We all waited in line (we were in the first 15 at the General Admission Side) due to our devote planning and patience we snagged some super seats that were ringside! There were 3000 people there. show is non abusive, gentle, and succsessful for all ages and ablilities. 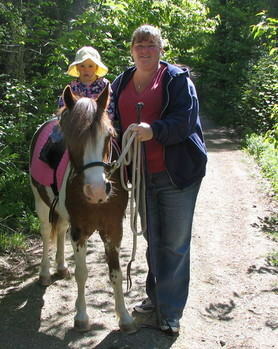 Sunday brought Kerstin, Whit, and Chauntel to the barn for "games". All were successful in thier Driving, Porcupine, Friendly, and Circling games. The car wash, teeter totter, barrels, and jumps are up and ready! 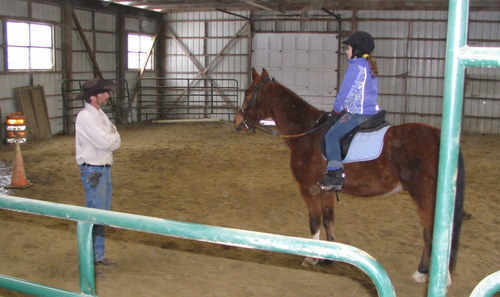 3/15/08 Addie, Whit, and parents attended a clinic by Chris Lombard, a fellow natural horsemanship instructor. bbin and Cash were troopers in the trailer, with the small storm we had that morning! 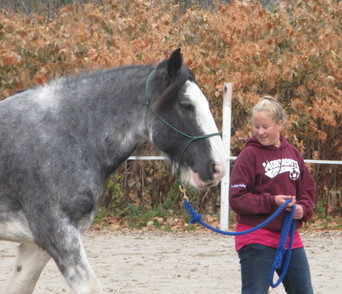 Addie and Chris decided to focus on confidence for herself, and working with Dobbin’s head pulls. 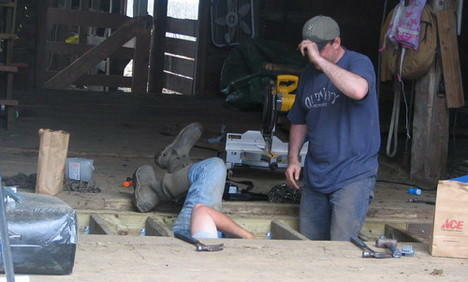 Chris was patient, listening to Addie’s questions and concerns…he also herd Dobbins rather loud whinnies in his ears! 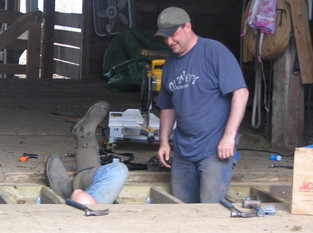 By the end of their session Chris had successfully combined these two into a real team working with each others strengths and Dobbin had relaxed enough so that he wasn’t even talking! Kudos to all! 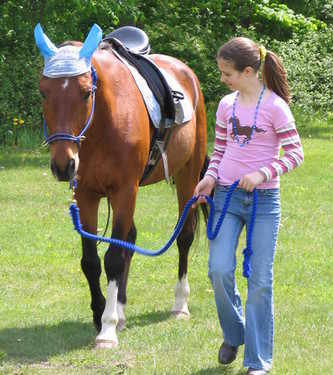 I asked Chris to work with Cash and I so that we can begin to attain our goal of bitless/bridless riding. 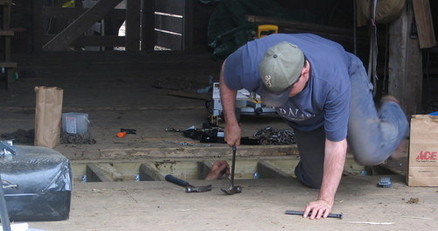 I found it helpful to have another set of knowledgeable eyes and a wealth of different skills or drills to work on. 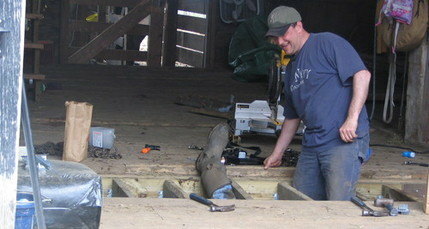 Chris was able to give me the boost and desire to get going even more…now when will SPRING get here?? ?